Since 1990, over 1000 fingers have graced the keys of the Western Front’s Disklavier. Pianists have included jazz greats like Horace Tapscott and Paul Plimley, singer-songwriters Robin Holcomb and Veda Hille, and post-classical performers such as Rachel Iwaasa. 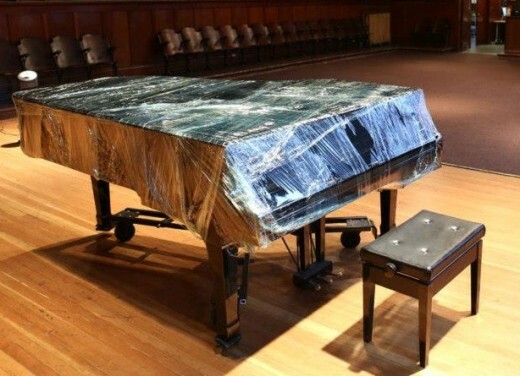 A contemporary player piano, our Disklavier has inspired composers and artists to challenge the piano’s typical capabilities—like when John Oswald conspired with programmer David Jaffe to recreate a blistering automated version of the Rites of Spring or when in 1994 Kazue Mizushima connected a giant web of silk to the piano and played it like a giant harp for her piece Eve of the Future. To keep on the forefront of innovation and cutting-edge technology, we need to upgrade our Disklavier. We need to raise a minimum of $20,000 to ensure the restoration of the instrument that is key to concertizing and production at the Western Front. Help us support the creation and presentation of boundary-less performance. Buy a piano key today or contact us on 604.876.9343 or development@front.bc.ca for more information. Click here to view photos of the new hammer assembly! Western Front’s Disklavier piano, wrapped and ready for restoration.